New for 2010 a Hot Springs Hot Tub. Completely remodeled fairway home with many custom upgrades. This 3 bedroom, 2 bathrooms, has been recently remodeled with all the luxurious upgrades you are looking for! The kitchen is a cook’s dream with brand new custom cherry cabinets, granite countertops, and all stainless appliances including a built-in wine chiller under the bar. Everything you need for preparing a gourmet meal is included for your use. The living room features a stack stone gas fireplace with a Pioneer 50-inch plasma and Bose surround sound stereo system that can also be swiveled to allow viewing outside on the patio. For the movie enthusiast we have even included Showtime. Outdoors you will find our bar with refrigerator and additional wine chiller, comfy patio furniture and a wood fire pit all with views of the fairway and Santa Rosa Mountains. Has leaf and can add chairs for six. Home is on Palm Desert Country Club. Which is open to the public. Close to the Living Desert Animal Park as well as many homes of the rich and famous. The home is conveniently located, very comfortable and as advertised, the kitchen is well stocked and perfect for entertaining. The hot tub was a delightful amenity after golf and the rear patio perfect for an afternoon read or nap. All and all a wonderful place to stay in Palm Desert. The house is in a great location for our purpose- the PNB Paribas Tennis Tournament- only 1 1/2 miles away. We'd walk it in 1/2 hr. House itself is lovely, well kept, comfortable beds, kitchen with all you need, back yard on the golf course with fruit trees (grapefruit juice every morning! ), and the lovely smell of citrus blossoms as we relaxed in the hot tub. House would not be so good for people with young children- lots of interesting antiques and things around the house. But for adults or older kids it was great. Had a wonderful time. Thanks! John's home on the Palm Desert CC (10th fairway) was absolutely perfect for our foursome of golfers (55+). The home was clean, modern and very well equipped from kitchen essentials to toiletry essentials. Great sound system inside, as well as out on the patio where we would hang during the evenings, taking advantage of the large 5 burner gas grill, hot tub and gorgeous views of the mountain skyline....what a fantastic "19th Hole". We have traveled to the Palm Springs area to play golf for 12 years running and this was one of our best trips, and what a very pleasant surprise it was to play the Palm Desert CC golf course....excellent condition from tee box to green. We are planning to reserve this home again next year and highly recommend this home and location to families, couples and golfers alike. This is a wonderful rental! The house was very clean with comfortable furnishings. All 3 queen beds were very comfortable. We loved the spa whirlpool which was very clean. The entire property was well maintained and the gourmet kitchen very nicely stocked. We would definitely rent this house again, and would recommend it to others. The mountain views are spectacular! The house is centrally located in a very quiet neighborhood. The kitchen and living areas are very roomy and stylishly decorated. The kitchen is modern and well-equipped. We especially liked the stand-up jets in the Master shower. Finally, the beds were very comfortable and we appreciated the extra bathroom toiletries. 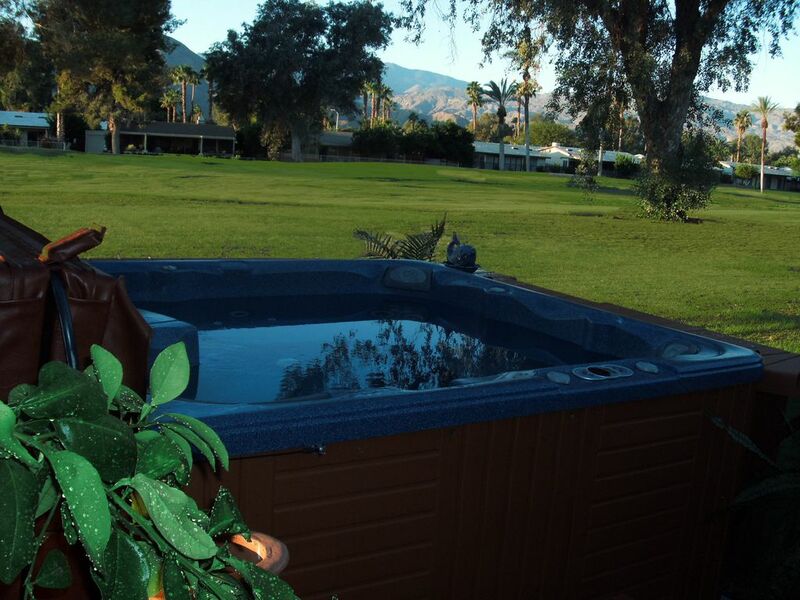 We would recommend this property to our friends coming to the Coachella Valley area.